In just a few days, members of the International Union for Conservation of Nature (IUCN) will conduct a much-anticipated field mission in the Yanbaru forest in northern Okinawa Island as part of the UNESCO/IUCN's evaluation process for the forest's bid for World Natural Heritage status. Guess what has just happened in the Takae district of Hiagashi village, near the World Heritage nominated area? At around 17:30 on October 11, a U.S. military CH 53 helicopter made an emergency landing and caught fire in an open land in Takae. As of 20:00, the fire and smoke are flaring in the darkness of the night. See this NHK site (Japanese). Also see this New York Times site. It is not clear whether the helicopter was either coming back from or was going to the U.S. military's Northern Training Area (NTA) when it made its emergency landing. NTA is located just next to the World Natural Heritage nominated area. I have no information on the status of the crew who were on the CH 53 aircraft. I hope they evacuated safely in time. I have no information on the extent of the damage the accident has caused on the area. Luckily, no one in Takae was hurt, a friend in Takae told me on the phone. This brings me to what I originally planned to upload on this blog today: Our factsheets "A World Natural Heritage Site next to U.S. Military's Training Area? : The Case of Northern Part of Okinawa Island, Japan." I have submitted them to the members of the IUCN field mission. The factsheets warned and predicted this unfortunate helicopter crash. In February 2017, the Japanese government nominated the Northern Part of Okinawa Island (NPOI), along with Amami-Oshima Island, Tokunoshima Island, and Iriomote Island for UNESCO’s World Natural Heritage (WNH). IUCN has begun its evaluation process for these nominated sites. Serious concerns have been raised, however. Not only is NPOI located just next to U.S. military’s Northern Training Area (NTA), but also the Japanese government failed to properly address in its nomination dossier submitted to UNESCO the presence and operation of NTA. Below are some important facts and issues regarding NTA and suggestions for IUCN and UNESCO evaluation teams. 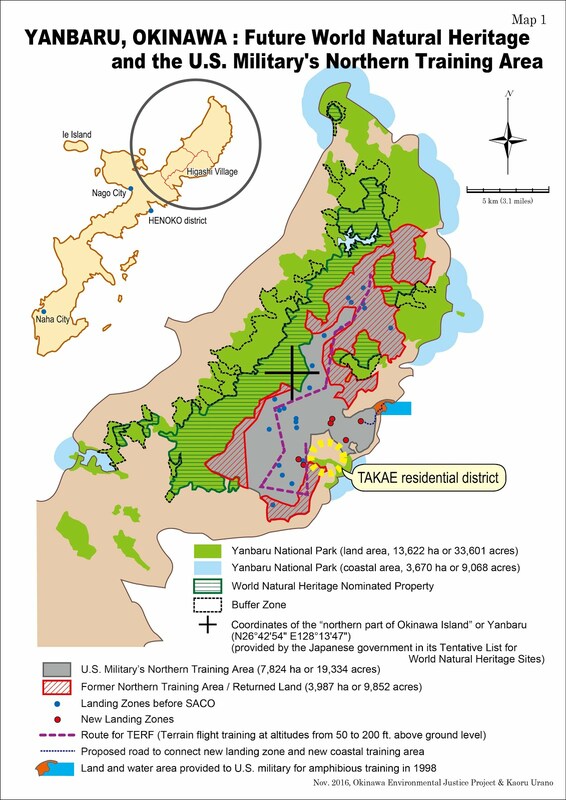 ・The U.S. military’s 3,900 hectares “Northern Training Area” (NTA) is located just next to NPOI. See Figure 1. ・NTA is used for “jungle warfare training” and low altitude “terrain flight training” of MV-22 Osprey and other aircraft. It is used in conjunction with other military bases and training areas in Okinawa as U.S. military conducts flight training between bases and training areas. See Figure 2. ・NTA is home to many endangered species including endemic and Japan’s “Natural Monuments” Okinawa rail (Gallirallis okinawae) and the Pryer’s woodpecker (Sapheopipo noguchii). See Figure 3. ・Forest fires and aircraft crashes occur in and around NTA, damaging the environment and threatening the lives of local residents. ・In December 2016, amidst protest, the construction of six new aircraft landing zones was completed in environmentally sensitive areas of NTA. Environmental impacts on areas outside NTA from the construction and operation of the new landing zones have been reported. ・The U.S. military, not the Japanese government, has exclusive control over NTA and other U.S. military bases and training areas in Okinawa. This means, when a forest fire or an aircraft crash occurs in NTA, the Japanese government or local authorities cannot enter NTA to conduct fire fighting operation or damage survey. ・It is unknown whether and how the U.S. military’s exclusive control over NTA affects the Japanese government’s management of NPOI as a WNH site. 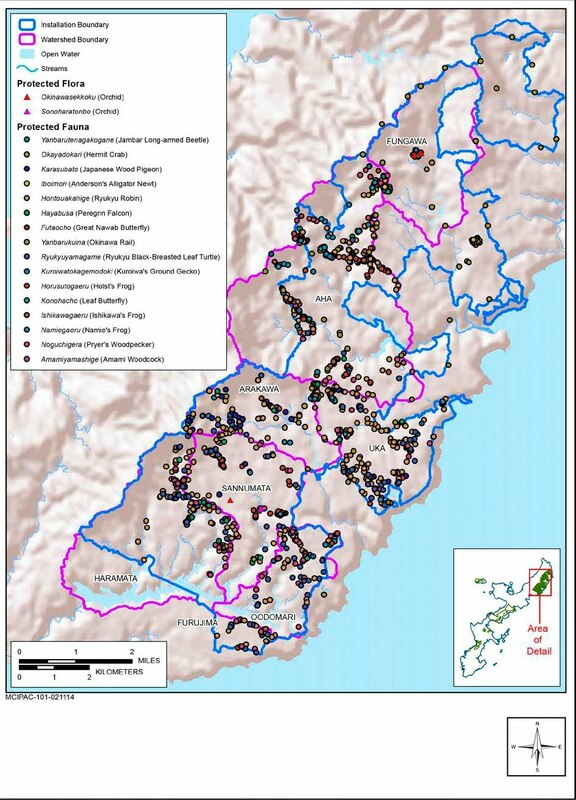 ・In IUCN Recommendation 2.72, IUCN requested the Japanese government to nominate the Yambaru forest (northern part of Okinawa Island) for WNH status. ・The Japanese government fulfilled this part of the recommendation as it nominated NPOI as a WNH site. ・In IUCN Recommendations 2.72 and 3.114, IUCN requested the Japanese and U.S. governments to conduct proper Environmental Impact Assessment (EIA) for the construction of landing zones in NTA. The Japanese government conducted its EIA and the U.S. military conducted an “Environmental Review” (ER) regarding the operation of MV-22 Osprey aircraft in NTA. ・These EIA and ER have been challenged by experts and NGOs. In fact, in November 2016, Okinawa Prefectural Government asked the Japanese government to redo an EIA regarding the construction of landing zones. The Japanese government declined to do so however. ・The Japanese government’s WNH nomination dossier failed to properly address the facts and issues mentioned above, undermining the scientific values of the dossier itself and making it extremely difficult for IUCN and UNESCO to conduct proper evaluation regarding NPOI. ・The dossier failed to incorporate any NTA-related documents produced by the U.S. military including Integrated Natural Resources and Cultural Resources Management Plan (2014) and Survey on Okinawa Rail at Jungle Warfare Training Center (2010). These documents are informative of the natural environment of NTA and management efforts put forth by the U.S. military although their primary objectives are to support the U.S. military’s training environment. See Figure 3. ・The U.S. military and U.S. government have not made public their stances on the WNH nomination of NPOI in relation to NTR: It is not known whether they support the nomination or not. See Attached document. ・IUCN and UNESCO evaluation teams recognize the U.S. military and U.S. government as important stakeholders in the nomination and inscription of NPOI for WNH. ・IUCN and UNESCO request the Japanese government to include information on NTA provided by the U.S. military into its WNH nomination dossier. ・IUCN and UNESCO evaluation teams, as well as the Japanese government, request the U.S. military and U.S. government to take part in and to support the inscription process of NPOI for WNH. 1. 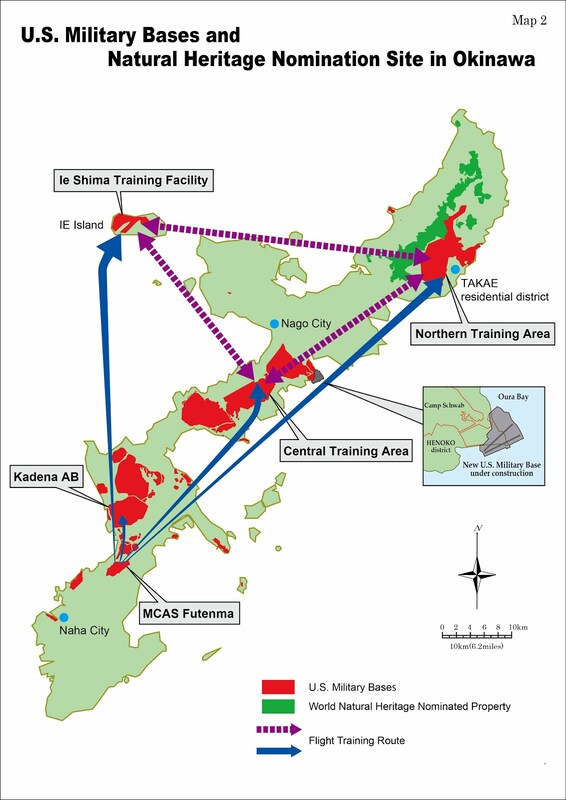 For general description of military training in NTA, see “Chapter 9-Camp Gonsalves/ Jungle Warfare Training Center” in Final Integrated Natural Resources and Cultural Resources Management Plan (2014), Marine Corps Base Camp Smedley D. Butler, MCIPAC Installations Okinawa, Japan. For description of MV-22 Osprey Aircraft training in NTA, see Environmental Review for Basing MV-22 Aircraft at MCAS Futenma and Operating in Japan (2012), Department of the Navy and the United States Marine Corps and Marine Corps Installation Command Pacific. 2. See “Chapter 9-Camp Gonsalves/ Jungle Warfare Training Center” in Final Integrated Natural Resources and Cultural Resources Management Plan (2014), Marine Corps Base Camp Smedley D. Butler, MCIPAC Installations Okinawa, Japan. 3. See Okinawa no beigun kichi [U.S. military bases in Okinawa] (2013), Military Base Affairs Division, Executive Office of the Governor, Okinawa Prefectural Government. 4. Miyagi, Akino 2017, “Yanbaruno dobutsu to seibutsu tayosei: Takae Aha de hakkenshita kisho dobutsu to heripado kensetsu ga dobutsu ni ataeta eikyo [Animals and the biodiversity in Yanbaru (Northern Okinawa Islanad): Rare Anmials Found in Takae and Awa areas, Higashi KUnigami, Okinawa and Actual Damages on the Aimals by Construction of Osprey Pad[s]]” in Nihon no kagakusha /Journal of Japanese Scientists, 52 (4), pp. 192-197. 5. See “Chapter 9-Camp Gonsalves/ Jungle Warfare Training Center” in Final Integrated Natural Resources and Cultural Resources Management Plan (2014), Marine Corps Base Camp Smedley D. Butler, MCIPAC Installations Okinawa, Japan. 7. See Environmental Review for Basing MV-22 Aircraft at MCAS Futenma and Operating in Japan (2012), Department of the Navy and the United States Marine Corps and Marine Corps Installation Command Pacific. 8. Nomination of Amami-Oshima Island, Tokunoshima Island, the Northern Part of Okinawa Island and Iriomote Island for Inscription on the World Heritage List. The Government of Japan (2017). 9. See Survey on Okinawa Rail at Jungle Warfare Training Center (2010), Marine Corps Base Camp Smedley D. Butler, MCIPAC Installations Okinawa, Japan. Figure 3: “Distribution map of protected plant and wildlife species” in NTA provided in the U.S. military’s Integrated Natural Resources and Cultural Resources Management Plan (p.122) (2014).